I recently watched the Bollywood film Lage Raho Munna Bhai. To woo a woman, a scoundrel pretends to be a Gandhi professor. Then Gandhi's ghost appears and coaxes the rogue to live up to his principles of truth and nonviolence. It's a clever concept. And how often does Gandhi feature in a movie--even a Bollywood movie? Almost never. P.S. Don't miss the previous movie, where Munna pretends to be a doctor! An example from Lage Raho Munna Bhai: Our scoundrel the "professor" is lecturing some old men on Gandhi. Someone asks what you should do if you see a boy throwing a stone at a statue of Gandhi. Our man starts to say, "Grab the boy and beat him," but the ghost tells him to say tear the statue down. In fact, tear all the statues down. Remove his face from the walls. Erase his name from public places. If you must remember Gandhi, do so in your hearts. The man is initially dumbfounded as he repeats these words. But eventually he starts to get it. India, its government, and its people (including him) have become corrupt, he says. It's not enough to venerate Gandhi in passing while your ignore him the rest of the time. People need to embody Gandhi's principles, not worship them from afar. Wow. Imagine if we applied that to Jesus, Abraham Lincoln, or Martin Luther King--all of whom might agree with Gandhi. If someone told Americans to tear down their crosses and churches and live like Jesus instead, we'd have riots in the streets. People would tar and feather this "radical," or lock him up for terrorism. ("He wants to destroy our buildings just like Bin Laden!") Conservatives would label him the most dangerous demagogue since Hitler. This also applies to American Indians. Americans worship the romanticized Indians in their movies and on their sports logos. But if you tell them real honor and respect means helping the people themselves, they look at you like you're crazy. They prefer to "honor" the fantasy, because it doesn't require work or sacrifice, while ignoring the reality. P.S. In an American remake, the ghost probably would be Adam Sandler. 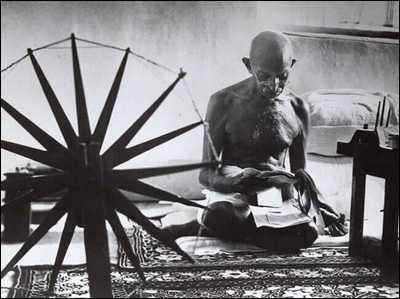 For more on nonviolence, see The Way of the "Orrior" and Happy 140th Birthday, Gandhi!
" If someone told Americans to tear down their crosses and churches and live like Jesus instead, we'd have riots in the streets. People would tar and feather this "radical," or lock him up for terrorism. ("He wants to destroy our buildings just like Bin Laden!") Conservatives would label him the most dangerous demagogue since Hitler." No truth to that at all. Those correctly identified as "terrorists" conservatives tend to always be mass murdering fanatics. There's no indication of Jesus being such, in conventional Biblical accounts or other accounts from other historic sources. Your comments are equating Jesus with Bin Laden.